Biofeedback - Pamela Morrison Pelvic Pain Physical Therapist, P.C. Biofeedback - Pamela Morrison Pelvic Pain Physical Therapist, P.C. Patients learn to better control the contraction and relaxation of their muscles using a computerized system. Surface electrodes (pod stickers) are placed on the skin over the muscle involved to (1) assess the muscles resting tone or “tightness”, (2) to determine if there is a muscle spasm present, (3) to assess the muscle(s) ability to contract. The electrodes are reading the electrical activity occurring in the muscle(s) during relaxation and during contraction. Biofeedback helps the patient to learn to relax a muscle or improve its ability to contract or improve the sequencing of its recruitment. 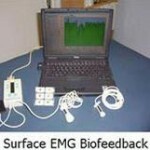 Using biofeedback to re-educate knee, shoulder, and low-back muscles when pain is present is very effective. Probes with surface sensors can be used for muscles that are more accurately assessed inside the body such as the pelvic floor muscles. Pelvic floor muscle dysfunction responds very well to use of biofeedback and can help in resolving pelvic pain. Similar biofeedback units that are hand-held devices are also used during therapy and for a home program.